Crepeau Court, 100 Front St., Woonsocket. The business hours of operation are 8:30 AM to 4:00 PM. The emergency answering service is available 24 hours. 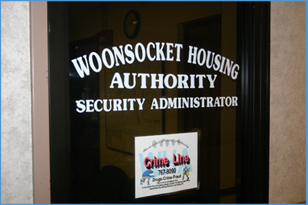 The Woonsocket Housing Authority takes the safety of its residents, staff and neighbors very seriously. 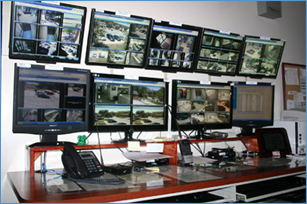 The Security Department handles all security and public safety matters. Security Department staff is trained in crime prevention, public safety intervention, emergency response and disaster planning. • A number of security measures are in place to protect the community. • The Security Department works closely with other WHA staff to identify and respond to resident needs, concerns and potential problems. This team approach allows for early and efficient resolution of each case. • The WHA has a 24-hour answering service. • Security personnel patrol every property overnight. Security cameras are in place at each building and development. • An entry tag access system is used at the high-rise building entrances. The system is monitored from the Security Administrator’ s office Visitors can gain access through an intercom/buzzer system and residents can view the entrance on Channel 11 of their own televisions. • Emergency phones are available in the lobbies of each high-rise building, on the administration building near the entrance to the Morin Heights community hall and on the front of the Campus of Learners building at Veterans Memorial. • Security staff meets with every new high-rise resident to review security procedures and address concerns. • High-rise residents fill out a refrigerator card which provides important health information to be used in the case of an emergency. They can also participate in the Telephone Reassurance Program, a once-a-day health and safety check. • Security personnel closely monitor all public areas at the family developments. • The WHA works closely with the Woonsocket Police Department. • The WHA will terminate the lease for criminal or drug-related activity committed by any household member or guest on or off the premises. The WHA works with the Woonsocket Police Department, Sojourner House, Department of Children, Youth, and Families and Department of Elderly Affairs to prevent and detect family violence of any kind. Contact the Security Department at 767-8090 to get a parking sticker. Once you have a parking permit, any changes in vehicle status must be reported to the Security Department. • Double parking is dangerous for other tenants, especially children, and is not allowed. • Unregistered vehicles are not allowed in the developments. • Cars on the grass or blocking trash pickup will be towed. • Tell your guests they can park only in Visitors parking spaces. Visitors should check the posted signs for the maximum parking time. Cars parked in a tenant’s assigned space may be towed. The WHA can take away a resident’s parking privileges with fourteen (14) days written notice if the vehicle is not in good working condition or presents a danger to other residents. If the vehicle is not removed within fourteen days, the vehicle may be towed on the fifteenth day at the owner’s expense.